Little Lands was established in 2009 and is now descriped as a destination terrarium store. In 2009 before terrariums re-surged as popular in interior design, Rachael had found a book published in 1973 on terrariums and thought she would attempt to make some. Many encouraging words and markets later, Rachael decided to unite her love of nature, art and role as childhood educator to open a terrarium store in 2014. Today Rachael and the Little Lands team are sought nationwide to create terrariums to suit any indoor setting, fit out office spaces or style functions and events. Little Lands is known for the intricate design of traditional terrariums, not your open vase with succulents or cacti. No two terrariums are the same – each is unique. 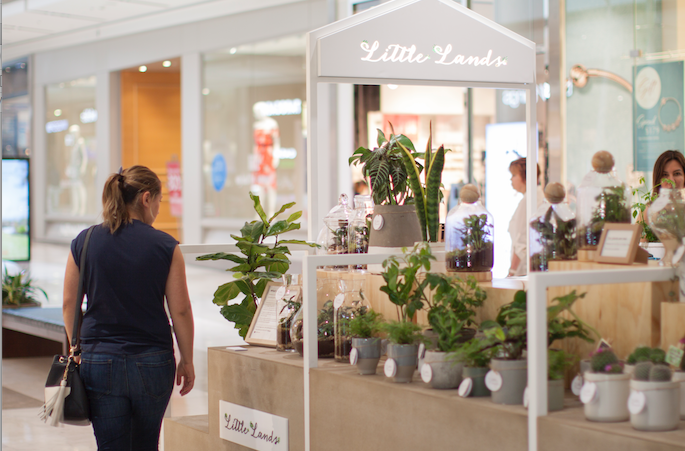 Little Lands concept store now open at Westfield Doncaster. Kiosk design & build by Centre Square.